VP, Threadless Internal Cups, Cartridge Bearing, Tapered 1-1/8" to 1-1/2"
Schwalbe Super Moto-X, 27.5" x 2.8"
Driving the Evelo Delta X is a Bafang BBS02 motor system that has been custom-integrated into a metal bottom bracket casing for improved aesthetic, increased ground clearance, and additional toughness. 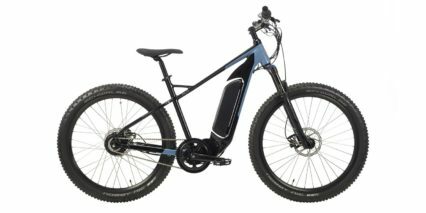 I have reviewed the stock BBS02, which is designed to bolt onto the spindle tube of a non-ebike, and it hangs forward. 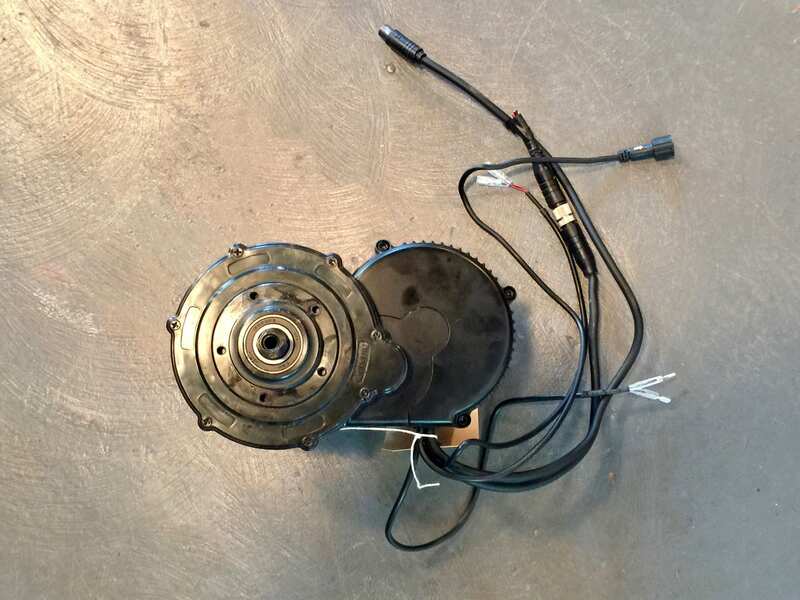 It is still one of the most popular aftermarket kits available, but it isn’t winning any beauty contests. 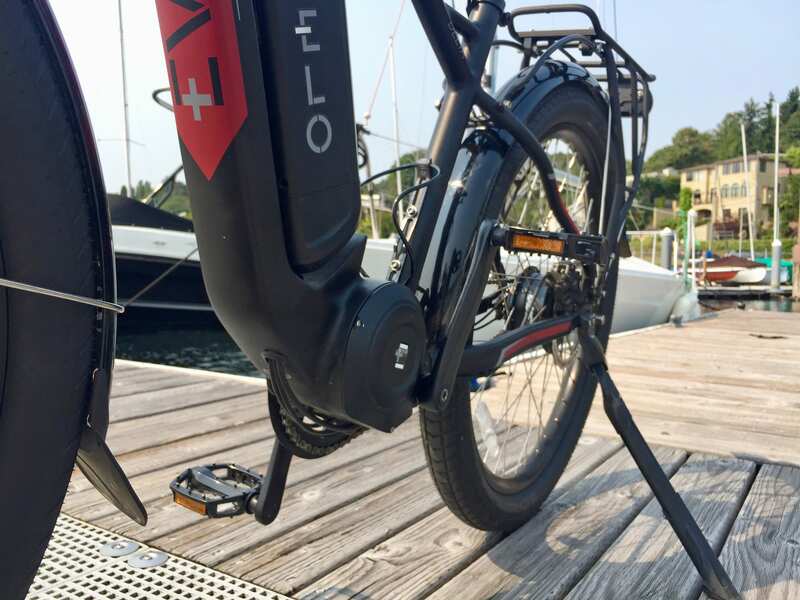 Messy cables and bolt-on battery packs are another byproduct of the stock BBS01 and BBS02, but all of that is overcome through EVELO’s custom solution here. 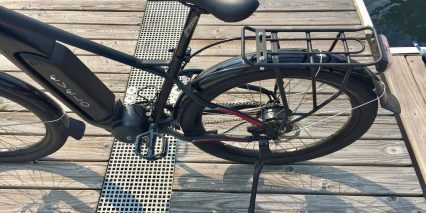 Some cables do protrude at the bottom bracket, but they are mostly hidden and the battery pack is not nearly as vulnerable… nor does it get in the way of that bottle cage or a triangular frame bag like these. This is part of what you’re paying for, a nicer look with less vulnerable cables and parts. 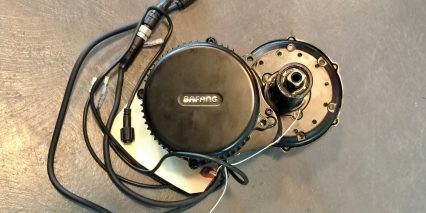 The motor itself seemed to perform as I had remembered from my first stand-alone BBS02 review in 2014. It relies on an on/off cadence sensor that isn’t especially fluid but does start and stop quickly. 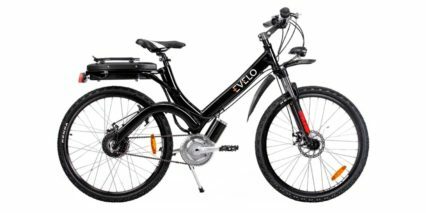 This could be a good or bad thing depending on your needs; you don’t have to push hard to make it start (unless the bike isn’t moving, it requires 5-degrees of rotation to activate), but it could feel abrupt if the power is set too high and you’re going from zero. 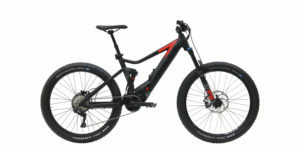 The motor can also be loud when riding in the highest levels of assist, especially in a lower gear. 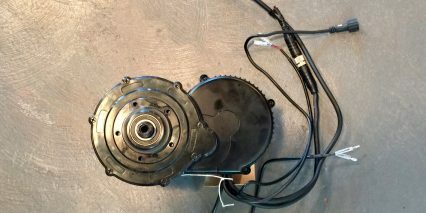 But one of the neat things about the NuVinci continuously variable transmission hub is that you don’t really have gears. Instead, there’s a smooth transition from faster cadence (meant for climbing) or slower cadence (meant for attaining higher speeds). You can shift at standstill and there are no clicks or bangs as you might experience with a traditional derailleur. 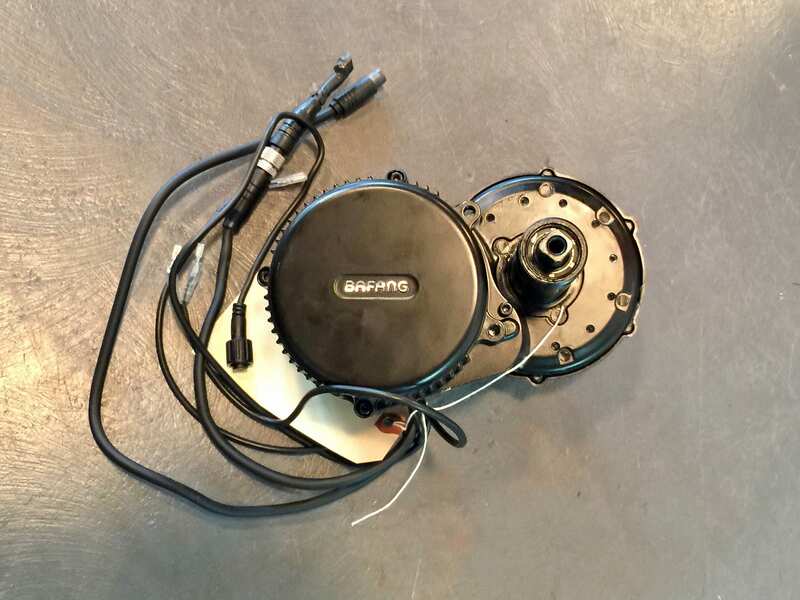 This is an important point because the Bafang BBS02 motor does not offer shift sensing or torque sensing… easing off of the pedals a bit is not going to slow the motor down if those cranks are still turning, and if you were to shift gears this way, the chain, sprockets, and derailleur would all take a beating. 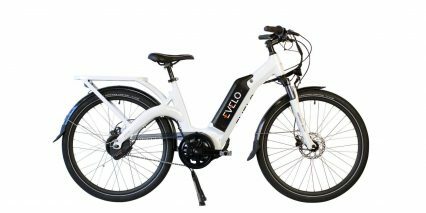 In this configuration with the Delta and Delta X, EVELO is minimizing drivetrain wear, reducing the potential for chain drops, reducing chain bounce and nicks on the right chain stay, and allowing you to shift at standstill. 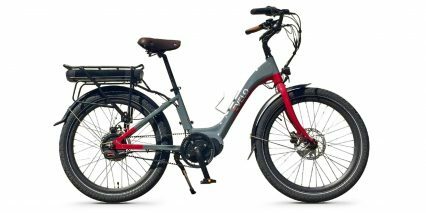 Note that when the motor is engaged and pushing hard, shifting can become physically difficult with the NuVinci N380, but is possible vs. many internally geared hubs like the Shimano Shimano Nexus and Rohloff Speedhub. 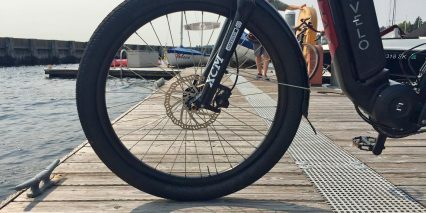 The NuVinci CVT is not a trivial or inexpensive component, and it’s not lightweight. 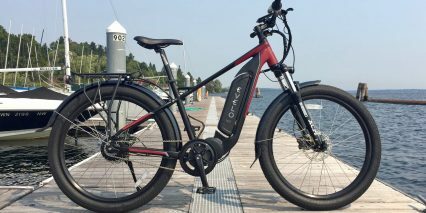 The battery pack on this bike is above average in terms of size and below average in terms of weight, exactly what you want. 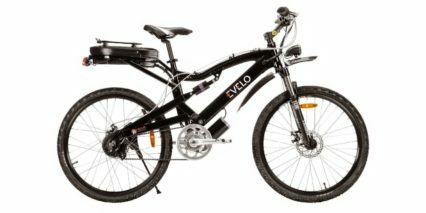 It offers a more efficient 48 volt power flow vs. 36 volts and has an 11.6 amp hour capacity for over 550 total watt hours of energy. Inside, there are Lithium-ion cells, which I assume are higher quality because of the raised energy density and Samsung branding and A & B rating. This type of cell is known for being durable but you can maximize the lifetime of the pack by storing it in cool, dry locations and making sure it is 50% full for long term non-use. 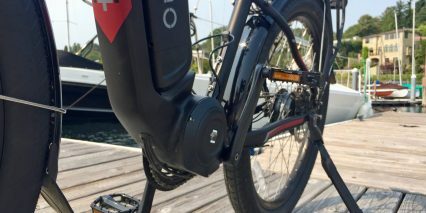 The battery clicks in from the side of the bike and has a single charging port on the right side that is high enough to clear the crank arm and pedal! 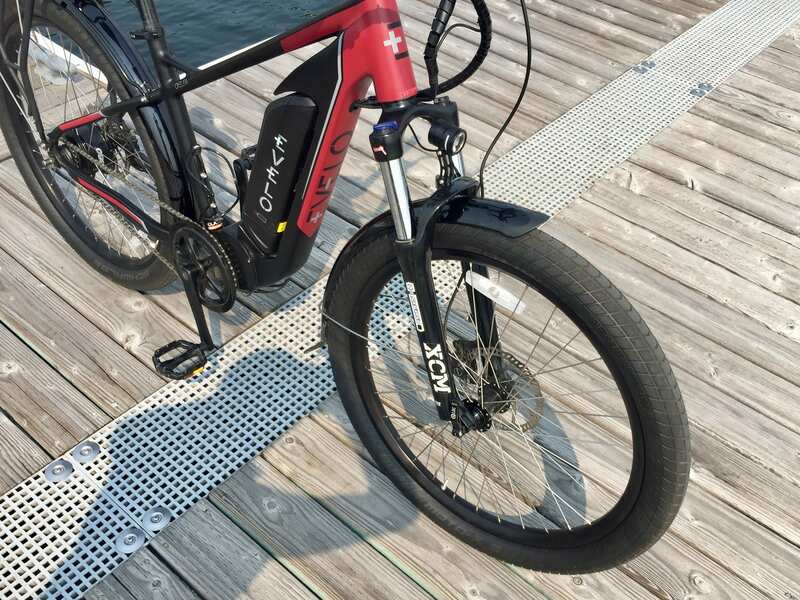 This is a big deal, if you forget that the bike is charging and bump the cranks, it won’t present the same opportunity for snagging and damage that so many other batteries suffer from. 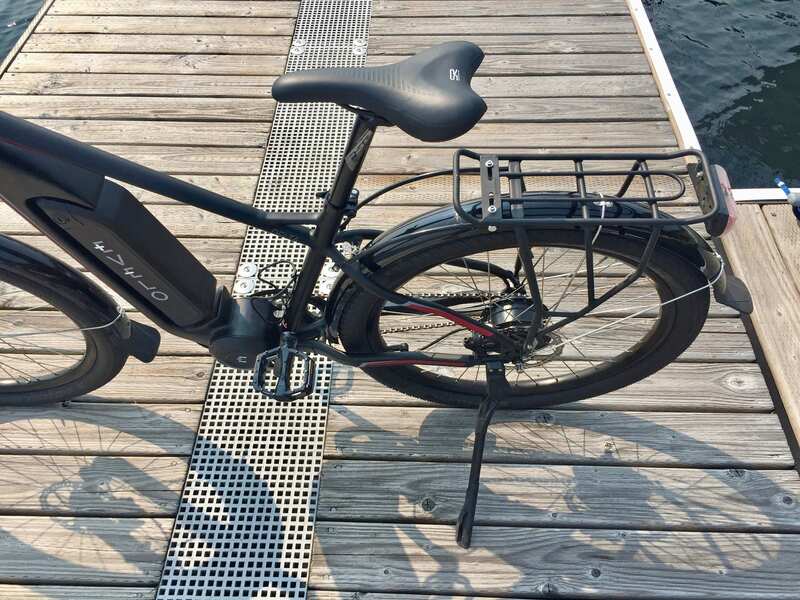 The charging port and charging plug are the exact same whether you’re filling the pack on or off the bike, and the battery design has a little indented handle at the top for safe transport. 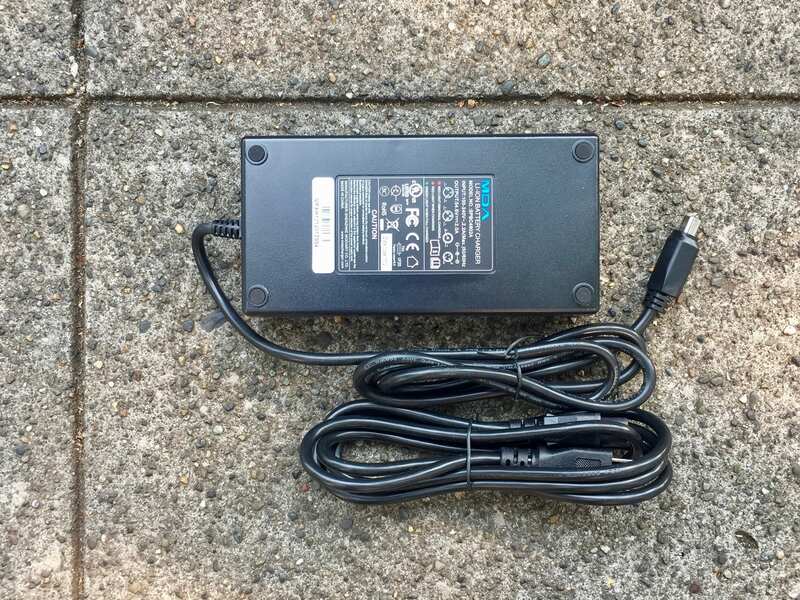 There are so many other battery packs that forego this type of design care, Yamaha and Bosch come to mind as good examples, but their packs have been smaller in capacity and they aren’t offered on bikes with throttles. Honestly, in some ways, I find the Evelo battery slot to be ugly, but I have to admit that it seems well protected and offers all the utility I could ask for except for a USB charging port. You do have that on the display, just not on the battery pack itself… a minor consideration. 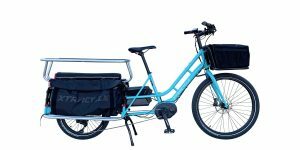 The pack slides into the frame mounting point smoothly and produced an audible click so I knew it was secure, it didn’t rattle during my test rides either… but the bike was brand new so I welcome your feedback. 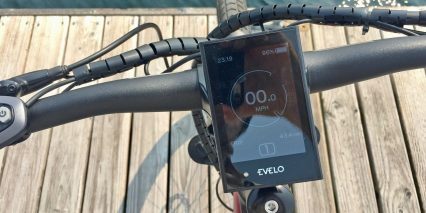 Operating the bike has become more enjoyable and engaging because EVELO replaced the older grayscale King Meter with a color model from Bafang called the DPC-18. It’s fairly comfortable to view and interact with when riding, but the control pad is pushed in from the left grip because of the trigger throttle… so there’s a bit of reaching there. The display is large and bright, making it easy to read if it’s not too bright or glaring, and the screen can swivel a bit to reduce glare. Once the battery pack has been charged and mounted to the frame, you can press the power button on the control pad to get it started. 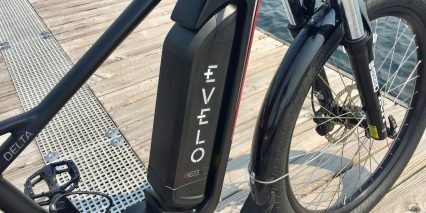 It shows all of the standard readouts like battery capacity and speed, but does so in a more precise and fun way than a lot of competing products. I like that the battery infographic shows an actual percentage vs. just five or ten bars, which aren’t as precise. Taking up the center area is a circle gauge that shows current speed and watt output (denoting motor power). Towards the bottom are trip stats including trip meter, odometer, max speed, and average speed. 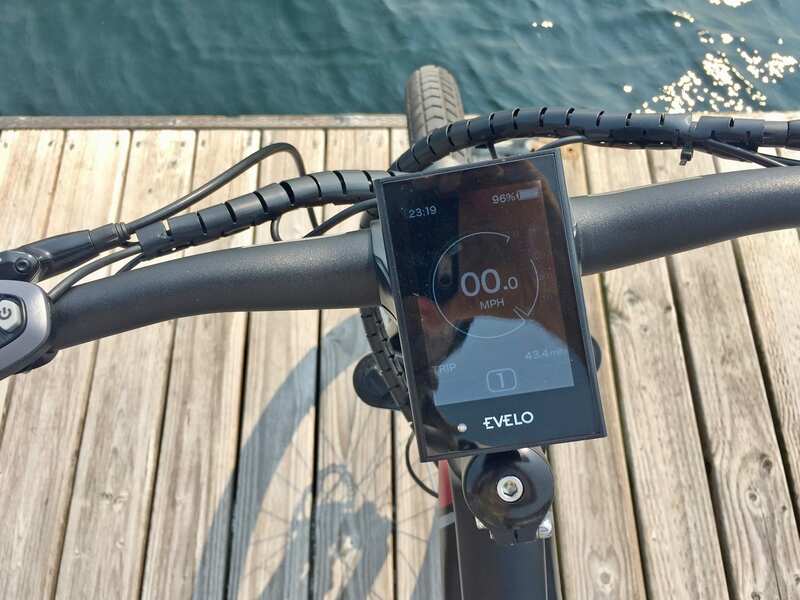 I was a bit confused for a moment when conducting this review, because I noticed that when cycling through the trip stats, by pressing i on the button pad, there were a few readouts that didn’t always show up. 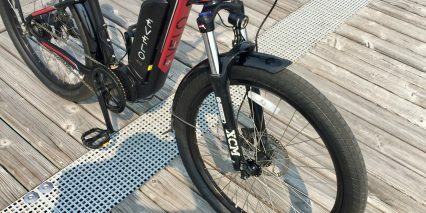 Those include range estimate, calories, and ride time. What I discovered, after some experimentation, was that these readouts become inaccessible once you’ve used the up and down buttons to change assist level. They are only available initially, and I suspect that this is a software bug from Bafang. 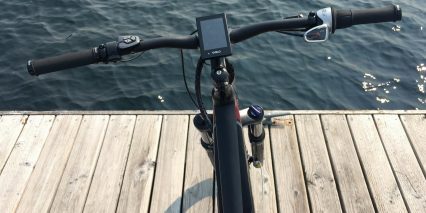 You basically have to turn the bike off, by holding the power button for a few seconds, and then turn it back on gain to gain access to these readouts… and this resets both calories and ride time. So, you basically have to stay in the default assist level 0 (where only the throttle is active) to be able to reach these menus, or navigate to them before changing assist. 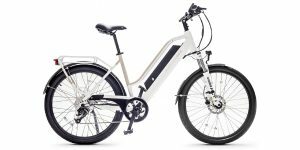 Considering that most ebikes don’t even offer these three readouts, I don’t want to complain too much… but I am disappointed that Bafang didn’t catch this at the factory because it probably affects hundreds of other ebike models and kits that rely on the same display. 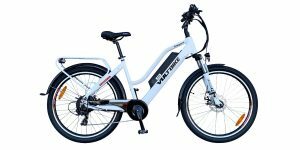 Bafang is a leading electric bike motor manufacturer but they can be rigid to work with from what I’ve observed. The 6mph throttle start is something that really frustrates me with the Max Drive used on the Galaxy models… why have they forced that annoying setting for the Max Drive motor but not for the BBS02? 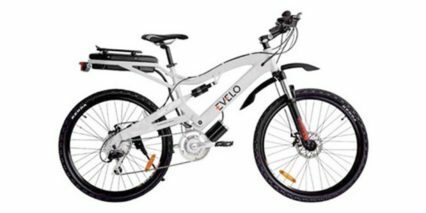 Anyway, the display menu limitation bug is not just limited to the Delta X model, but all other EVELO ebikes with the color DPC-18 display as well, such as the Aurora. I like that the display can be swiveled to reduce glare and that button pad has a dedicated light button so it’s simpler to understand and use than some other products I’ve seen. This light button only activates the headlight and not the backlight, because it is independent. It would be nice if the display was fully removable, so it could be kept out of the weather and away from scratches and bumps at bike racks. I’m not sure that the color screen was necessary vs. backlit grayscale, but it does look nice. I also appreciate how open the display settings are. 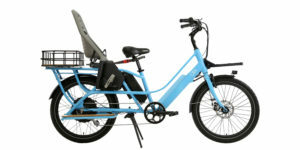 You can double tap the i button to adjust things like units units (mph or km/h), display brightness, automatic power off time setting, levels of pedal assist (3, 5, or 9), different readout styles or views, trip reset, wheel size, speed limit, ambient light sensitivity (for automatic lights turning on), password, and clock. 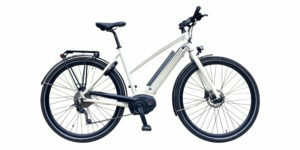 You can also check on the battery status (number of cycles and health) as well as any error codes and self diagnostics. The bike ships with a 20mph cutoff to comply with Class 2 laws in the US, but that can be lowered for people who might not be comfortable going so fast… not just raised :) Given the slightly larger tires, thicker spokes, reinforced frame, and excellent battery position on this model, I did feel comfortable coasting faster down some of the large hills we checked out near the shop in Seattle. I did not experience speed wobble or much frame flex. 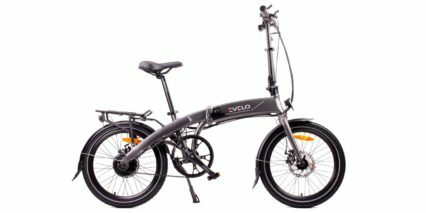 The Delta X feels balanced and solid, it accelerates and climbs well despite the extra weight because the motor is so powerful. 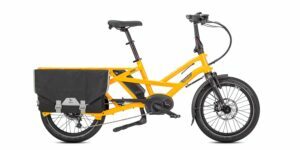 I have become a fan of the Plus Sized tires that in this case, are 27.5″ x 2.8″ because they improve stability and comfort… The little bit of drag that is introduced is more than offset by electric support here. 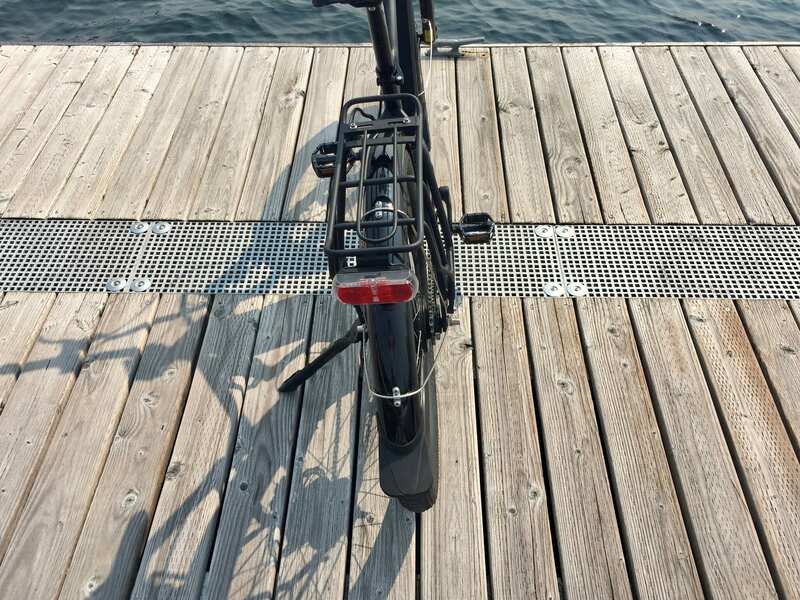 Even though the suspension fork is a spring design vs. air, it’s nice to see lockout for people who experience bob or just don’t need the extra shock absorption because they’re on pavement most of the time. I do appreciate the sturdy thru-axle and tapered head tube setup, because that allows the fork to be upgraded easily, if you want to forego the front fender bosses and maybe ride fenderless. 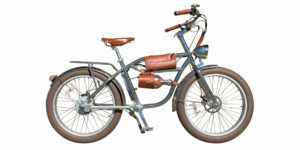 You could easily swap out the tires for different terrain use and bring the bike back towards a mountain model like the original Delta. 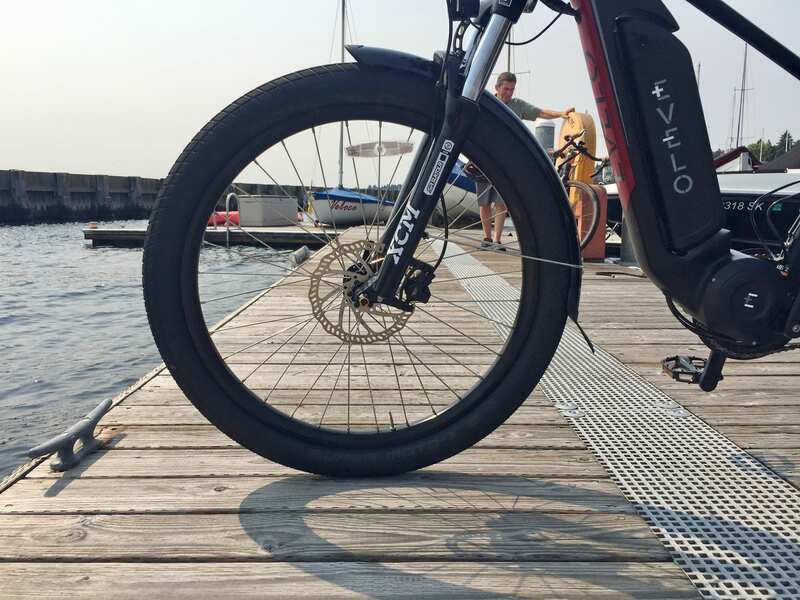 It’s an incredibly versatile platform that I thoroughly enjoyed testing and could see myself “adventure touring” with, especially with an additional battery pack or access to charging spots along the way. Again, it’s not perfect, but it is fun and capable. 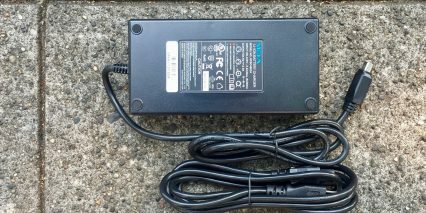 Another little area of improvement would be a faster battery charger vs. the default 2 amp charger that it comes with now. It’s neat to be able to shift at standstill and I see why they opted for a serviceable chain here vs. a belt on some of the other models. 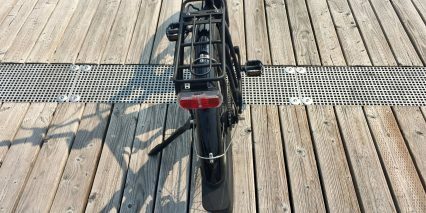 Perhaps they skipped the belt in part because it requires a frame modification, a cutout that could reduce structural integrity. 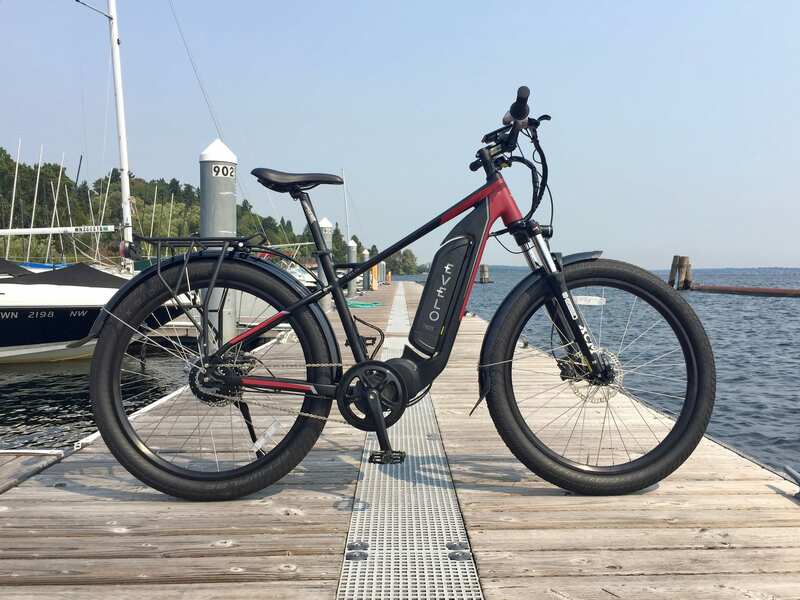 I noticed that I was not striking my shoes while pedaling this ebike, even though it has fatter tires, because the rear dropout does not use Boost hub spacing. 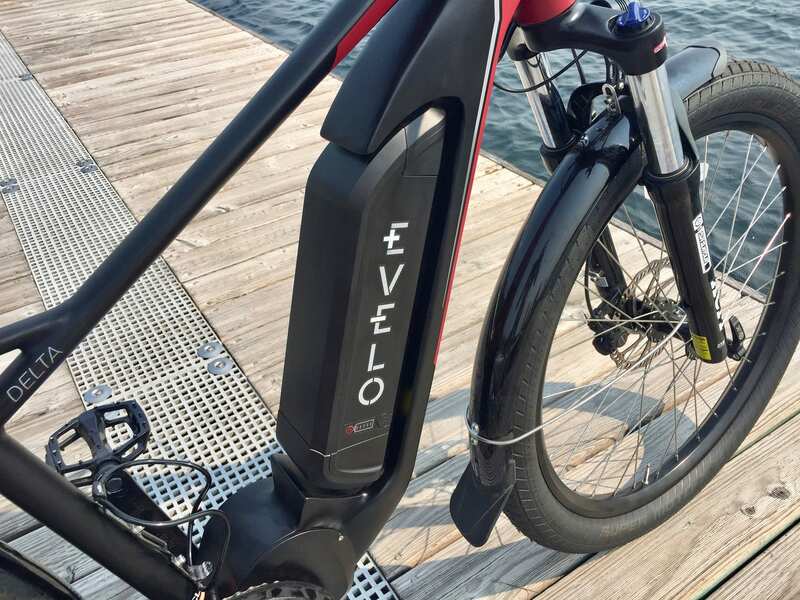 Big thanks to Evelo for partnering with me on this review, and their employees Alex and John who met me in Seattle and rode up a few super steep hills while I filmed. This company has always been a leader in terms of support, but their latest generation of products have raised the bar and truly impressed me. 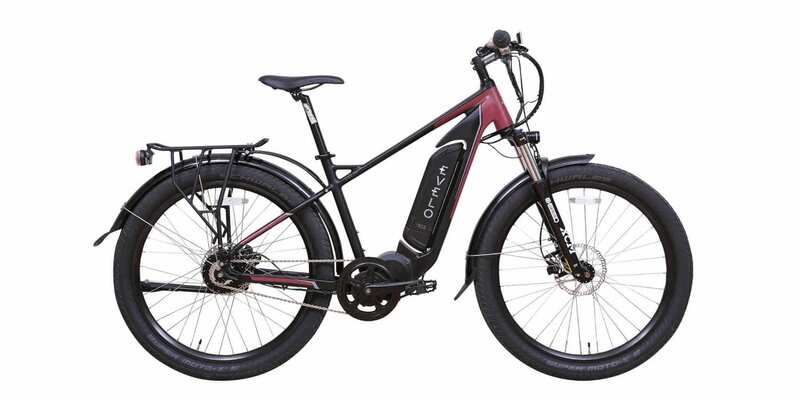 If you like how it looks, appreciate power and a throttle mode, and can justify the slightly higher price… which is very reasonable given the drivetrain and custom frame, it could be a great choice. 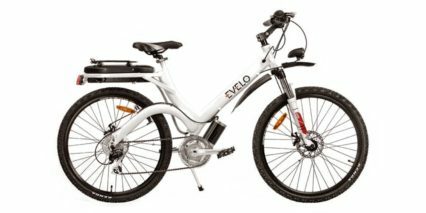 As always, I welcome your feedback and experiences with the product and company in the comments below or in the EVELO forums here. Very nice review. I like the display and features. Fairly advanced and user flexible. 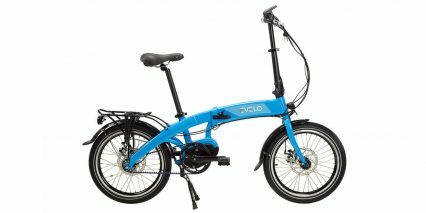 The mix of a 750-1000W mid drive and nuvinci in unique. I’m pretty sure that the display does not have range estimate nor calories readouts (at least I can’t find them on mine). 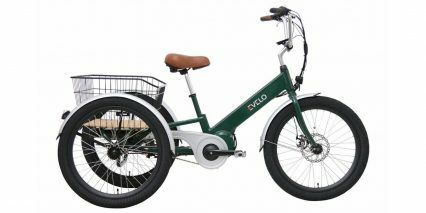 For a 6′ 2″ rider, how much would I notice what I assume is this smaller frame for the Delta X compared to other bikes that have frame sizes that may technically be a better fit? Hi Eric! 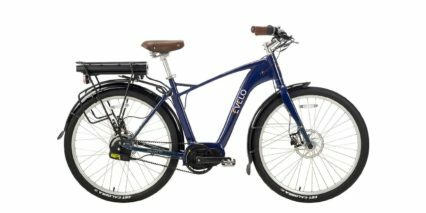 My experience has been that you can usually change the stem, handlebar, and raise the seat (or even get a longer seat post) to make bikes fit taller people. Your body position will probably be more upright than if the frame was taller/longer but as long as you aren’t hitting your knees on the handlebars, it should be okay. 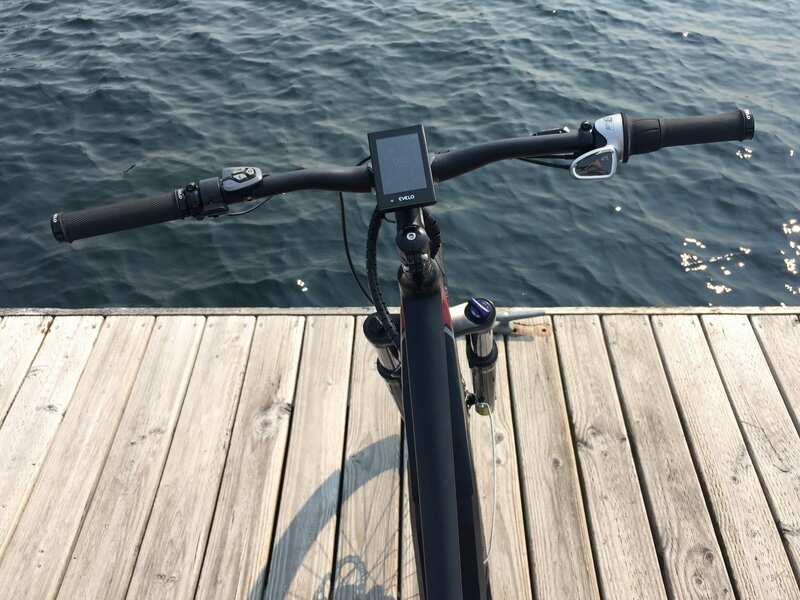 The difference between frames is usually just an inch or two, and that is spread through the main triangle… so the seat post is longer and the reach is probably longer on a Large or XL frame, and that’s how you get the leg space. So yeah, with a longer and taller stem, maybe even a stem riser, the Delta X would probably be alright for you. Thanks! 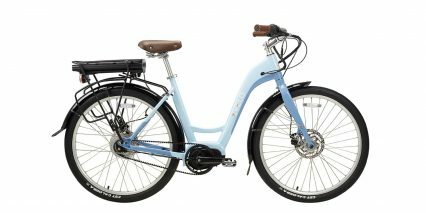 I really appreciate the feedback – and the comprehensive reviews you have provided on so many bicycles.